THEN: This is San Francisco City Hall under construction. Construction began in 1913 and was completed in 1915. Arthur Brown Jr. was the architect who designed the building. The camera that took this picture was attached to a kite; the camera's shutter was actuated by the photographer via a cable, while the photographer was standing on the ground. The camera could snap only one picture at a time. The photographer would have to reel in the kite, remove the exposed photographic image from the camera, then install a new, unexposed piece of film in the camera and relaunch the kite if he or she wanted to take another photograph. This photo was snapped in 1915. 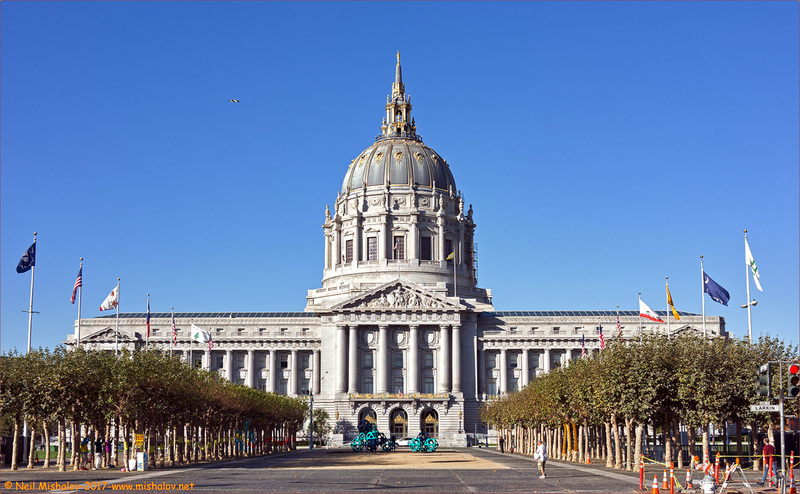 NOW: San Francisco City Hall as seen today. It took two years to build this structure. 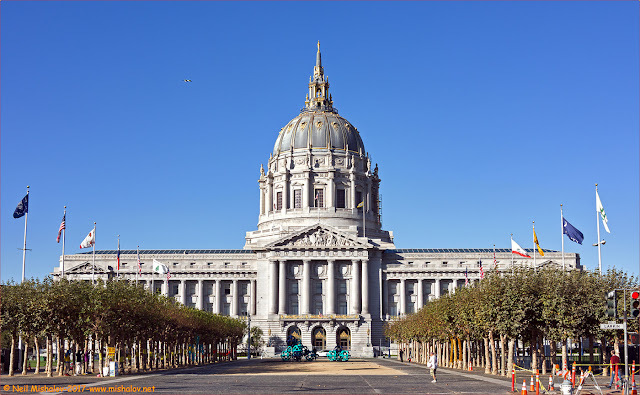 This building was constructed after the previous San Francisco City Hall was destroyed in the Great Earthquake and Fire of 18 April 1906. 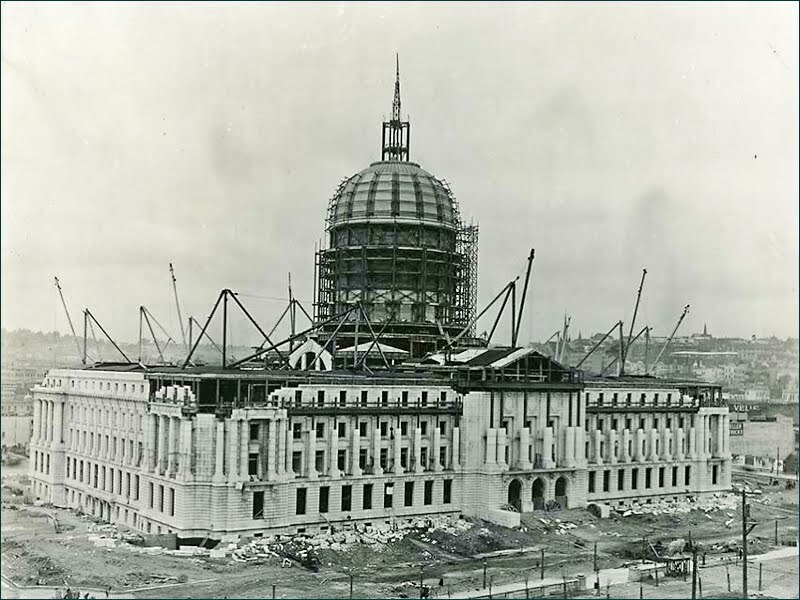 An earthquake of 7.1 magnitude struck on 17 October 1989 and damaged the current city hall so severely that the dome itself moved four full inches. Repairs and restoration were completed in 1999. An earthquake safety enhancement called a base isolator system was installed within the building. A base isolator system absorbs shocks and movement at a building's foundation, which will hopefully protect the integrity of the above structure. THEN: San Francisco War Memorial Veterans Building, 25 April 1945. On this day in San Francisco, representatives of 46 nations met to discuss the creation of the United Nations, an international organization intended to maintain peace between nations. The conference began as troops from the United States, and the Soviet Union linked up on the Elbe River, in central Europe, a meeting that dramatized the collapse of Nazi Germany and the end of World War II in Europe.The San Francisco Conference lasted two months and eventually included 50 countries. The leaders at the conference confirmed the organization of the United Nations and drafted the United Nations Charter, which was signed at the War Memorial Veterans Building by President Truman and other heads of state on 26 June 1945. The building was designed by Arthur Brown Jr., and was dedicated on Armistice Day, 11 November 1932. NOW: The War Memorial Veterans Building is now commonly known as Herbst Theatre. 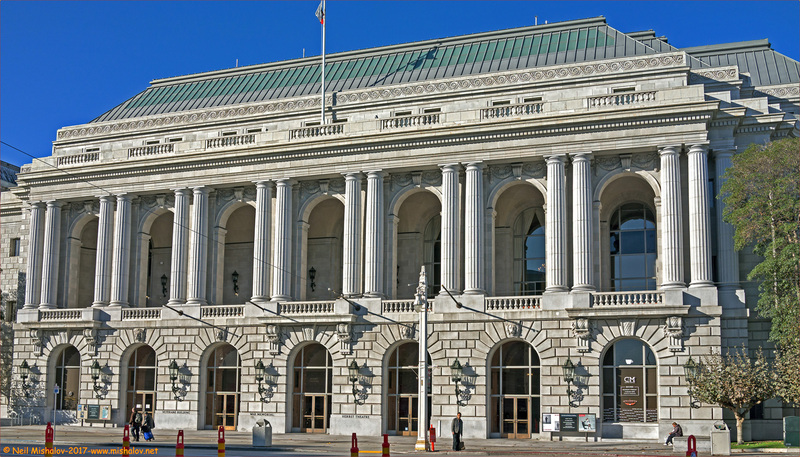 Distinguished as the site of the United Nations Charter signing in 1945, the building is now the primary venue for some of the Bay Area's premier cultural organizations. The 892-seat auditorium has been renovated, and it contains murals painted by Frank Brangwyn for the 1915 Panama-Pacific International Exposition. THEN: The Geary Car House in 1918. 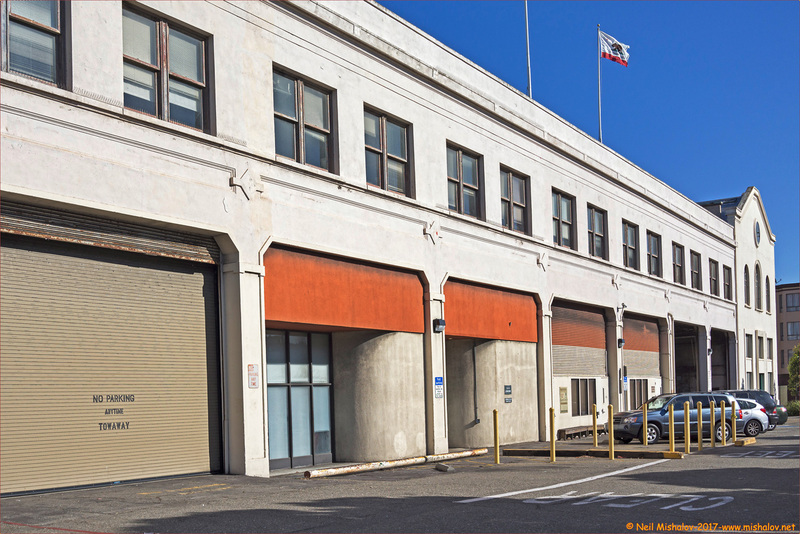 This building was the first San Francisco Municipal Railway streetcar storage and maintenance facility. It was built in 1912 as a single story building. The second floor was added in 1915. 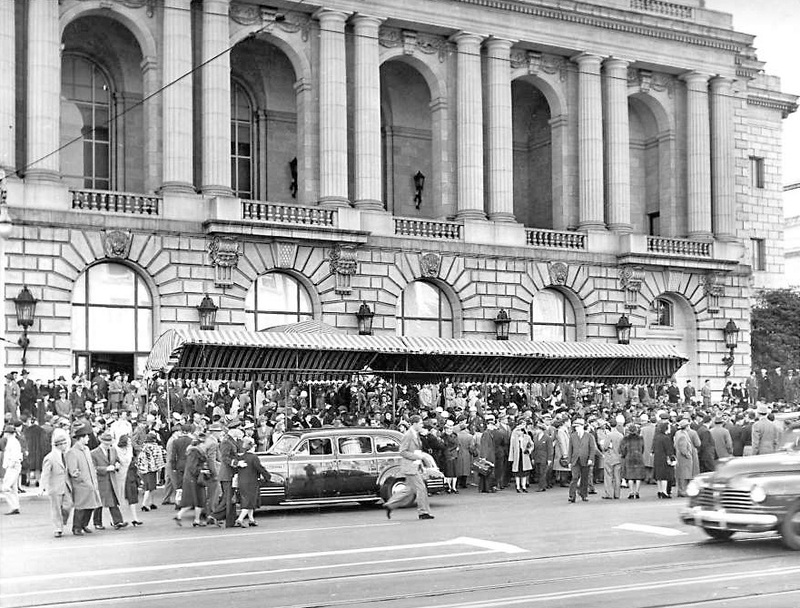 The building ceased being a streetcar facility after the Geary public transit lines were converted from electric streetcars to electric buses in 1956. Muni built the Presidio Division bus yard behind the Geary Car House in 1949. This photo shows Muni Superintendent Fred Boeken at the Geary Car House in 1918. Behind him are the first five gasoline-powered buses purchased by the City of San Francisco. NOW: This is the Geary Car House building today. It is still being used by the San Francisco Municipal Railway. The Presidio Division bus facility is located behind this building. 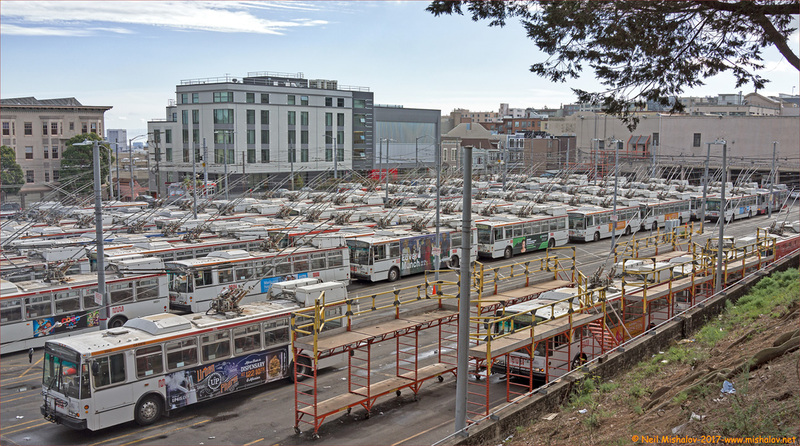 NOW: This is a view of the Presidio Division electric bus yard. It is located at the rear of the Geary Car House. Many electric buses are parked in the lot on this, a Sunday morning. 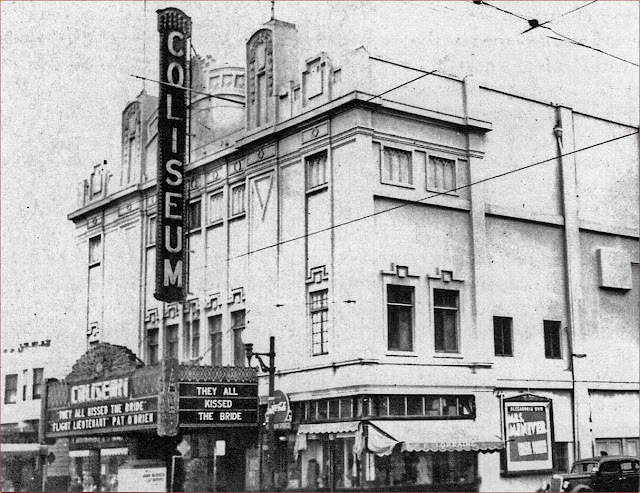 THEN: The Coliseum Theatre opened on 22 November 1918. It is in the Richmond District of San Francisco and is located at the southeast corner of the intersection of Clement Street and 9th Avenue. 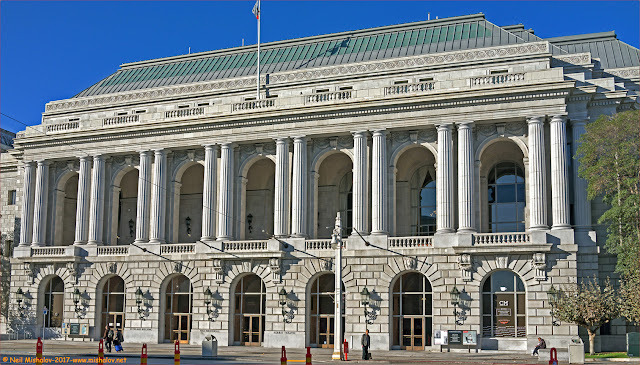 The theatre was severely damaged by the Loma Prieta Earthquake of 20 October 1989. This picture is circa 1942. NOW: Here is the Coliseum Theatre building today. The building was rebuilt with condominium apartments upstairs and a Walgreen Drug Store on the first floor, after the 1989 earthquake. It appears that the theatre's auditorium was reconstructed to contain two floors of apartments. 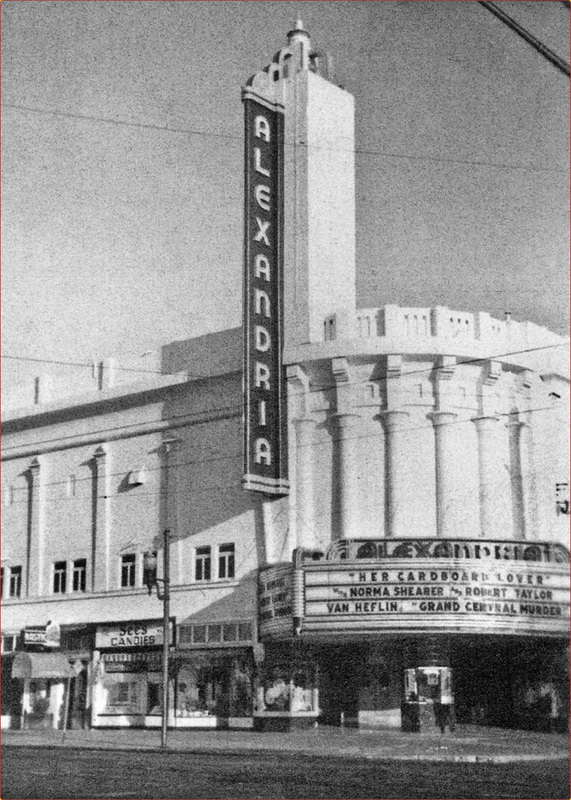 THEN: The Alexandria Theatre opened on 26 November 1923. 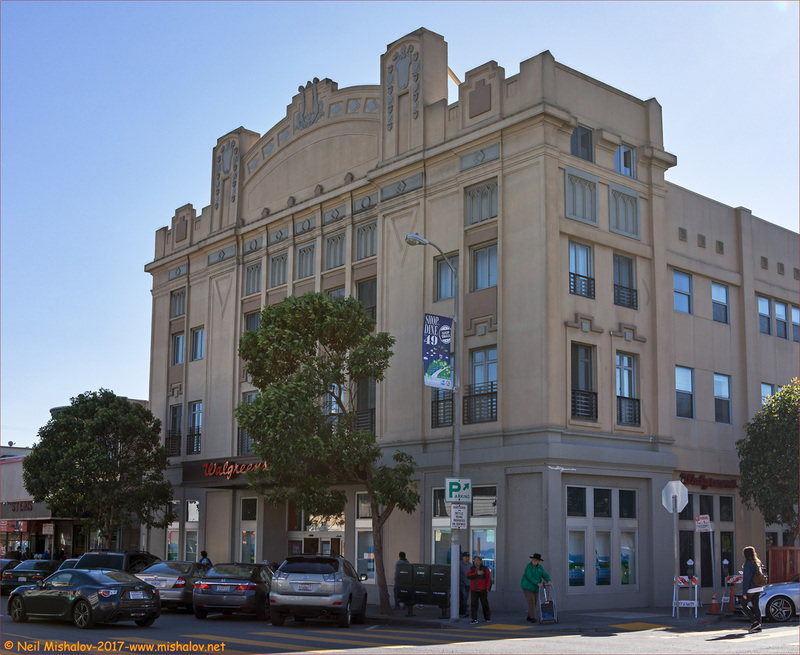 It is located in the Richmond District on the northwest corner of the intersection of Geary Boulevard and 18th Avenue. Long-run, reserved-seat roadshow attractions became its trademark, beginning in 1958 with a 48-week showing of the movie South Pacific. The theatre closed in 2004 because of decreasing ticket sales, and faced an uncertain future. This picture is circa 1942. 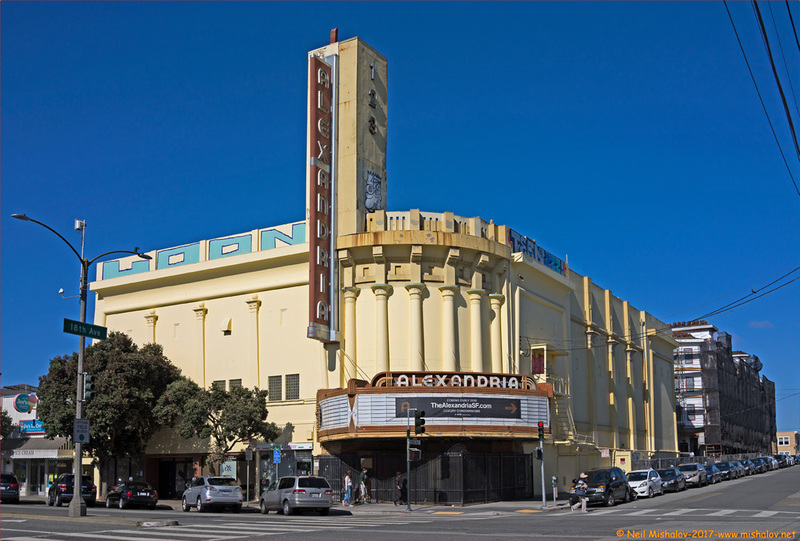 NOW: The Alexandria Theatre has remained closed from 2004 to now. After years of discussions, proposals, and counter-proposals, an agreement was reached by the parties involved, and the Alexandria Theatre is currently in the midst a significant upgrade. The theatre's parking lot was located behind the theatre. You can now see a condominium apartment building under construction at that locale. It will be a four-story building with forty-three one, two and three bedroom units. The theatre building is scheduled to be converted to a swim center and office spaces. THEN: This photo was taken on 1 November 1917; 100 years ago. The photograph was taken by an employee of the San Francisco Municipal Railway. 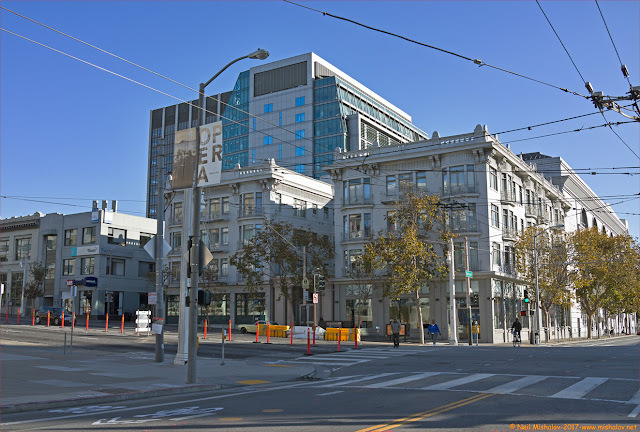 The location is at the corner of Van Ness Avenue and McAllister Street. 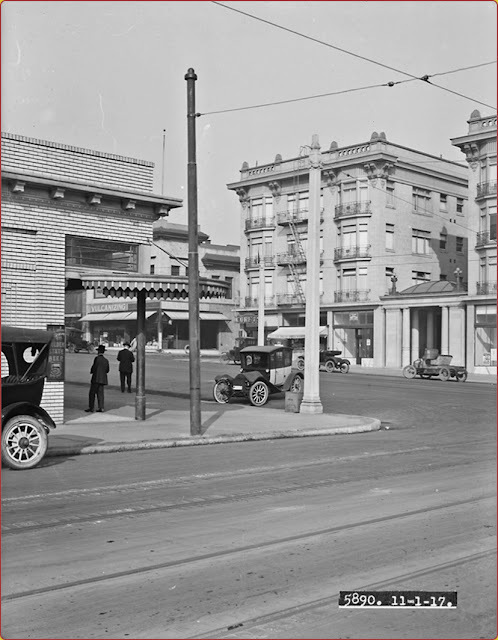 The brick building on the left side of the photo is now the site location of the California Public Utilities Commission. The view is looking northeast, across Van Ness Avenue. This picture is courtesy of Market Street Railway, which wrote an interesting and informative review about this photograph. NOW: Here is the view from the corner of Van Ness Avenue and McAllister Street, 100 years later. There is now a big hulking building in the background, unfortunately. The original apartment building is visible, and it appears to look the same today as it did 100 years ago. 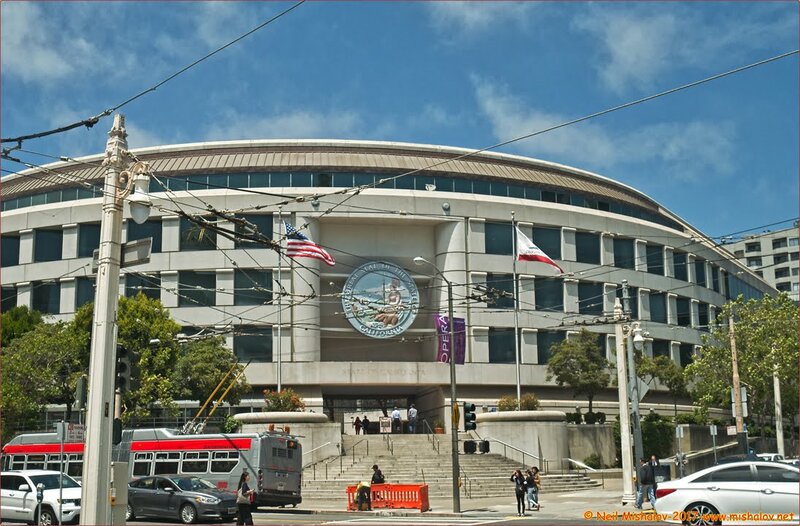 NOW: The California Public Utilities Commision building is located on a parcel of land which is just out of view in the two Van Ness and McAllister photos as seen above. In this photo, you can see a Muni electric powered bus on McAllister Street, just below Van Ness Avenue. 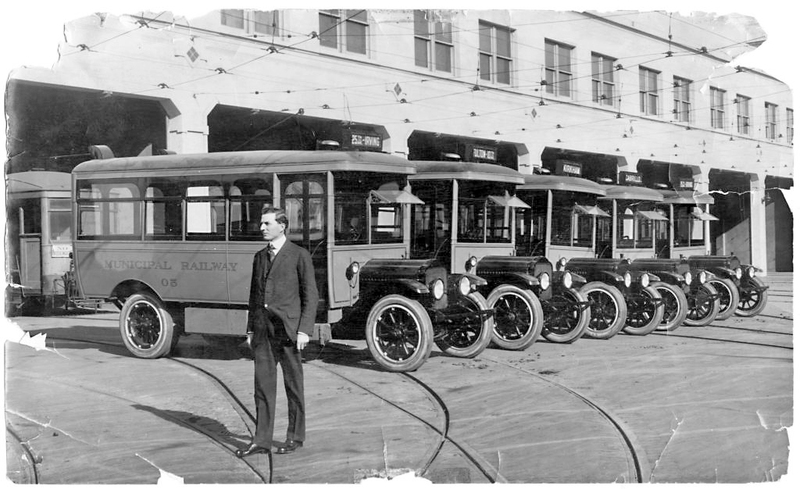 The bus is on the same route that was used 100 years ago by electrically powered streetcars. The concrete pole in front of the California Public Utilities Commision building appears to be the same concrete pole as seen in the above picture that was taken 100 years ago. 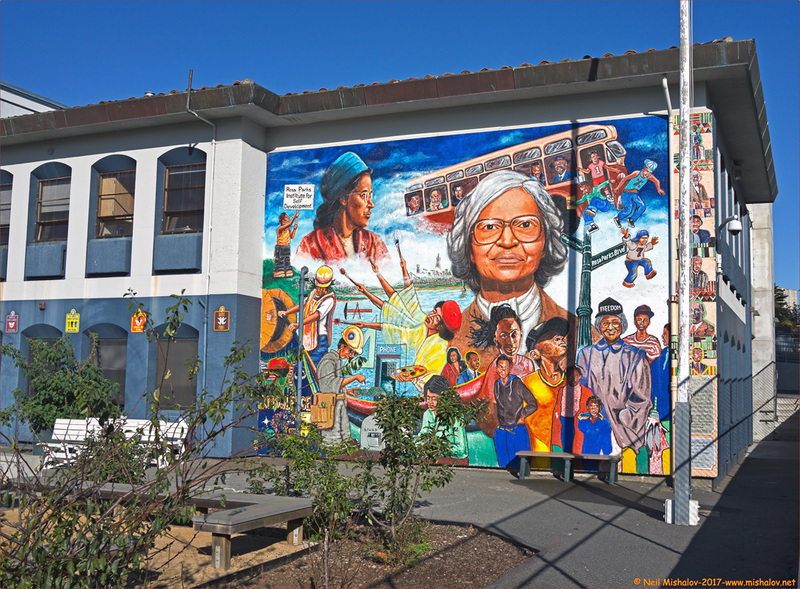 Rosa Parks mural. I happened upon Rosa Parks Elementary School during this ramble. The school is located on O'Farrell Street at Hollis Street. This beautiful mural, painted on an exterior school wall, caught my eye. The artist is Santie Huckaby. The distance traveled was approximately 7.8 miles (12.5 kilometers). Mile markers are displayed on the GPS generated track. Click on the image to see the full-size map. 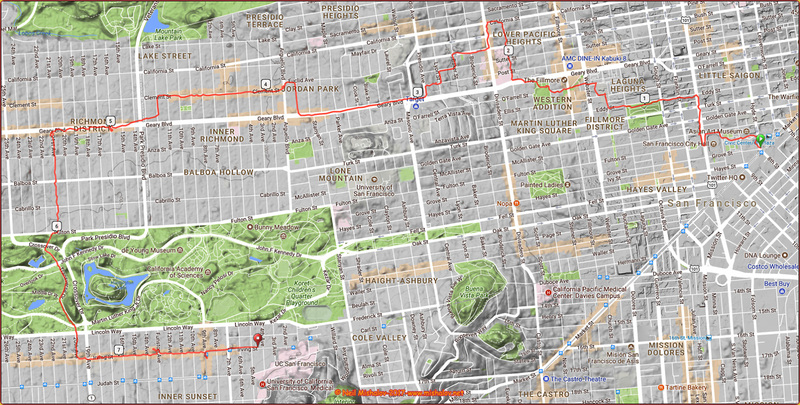 GO HERE to view part two of San Francisco then & now. GO HERE to view part three of San Francisco then & now. GO HERE to view part four of San Francisco then & now. GO HERE to view part five of San Francisco then & now. GO HERE to view part six of San Francisco then & now. San Francisco Municipal Transportation Agency was helpful in assembling this gallery of ‘Then and Now’ photographs. Catherine Accardi is the author of San Francisco Landmarks. Her book was helpful in assembling this gallery of ‘Then and Now’ photographs. Jack Tillmany is the author of Theatres of San Francisco. His book was helpful in assembling this gallery of ‘Then and Now’ photographs. Market Street Railway was helpful in assembling this gallery of ‘Then and Now’ photographs. A Sony camera was used to take the present-day photographs.